The Kempinski Hotel Corvinus Budapest was the first five-star hotel in Hungary when it opened in 1992, and is located in the heart of everything. I love revisiting places that I have already been, because when you have a really remarkable experience, revisiting it seems to add to that memory, making the memory even more spectacular. When I knew that I would be going to Budapest for a few days for business, I fondly remembered my stay with my husband, Edward, at the Kempinski Hotel Corvinus Budapest, Erzsébet tér 7-8, 1051 Budapest, (www.kempinski-budapest.com), and knew that I had to revisit this special place, and add to that memory. Although I did not have time on this trip to stay at the Kempinski Hotel Corvinus Budapest, I did find time to take my mother, Victoria, who was my travel companion on this trip, to have dinner in their restaurant. The Kempinski Hotel Corvinus Budapest was the first five-star hotel in Hungary when it opened in 1992, and is located in the heart of everything. This exquisite 365-room hotel just completed a full renovation in March 2003, and put special emphasis on its guestrooms, installing heated floors in their bathrooms and enhancing the lighting, among many renovations. Luxury abounds at this hotel from the fitness center complete with state-of-the-art equipment, pool, sauna, massage rooms and a solarium, to the boutiques and beauty salon, to the 2 cactus gardens under their atrium roof, as well as over 1,000 pieces of art throughout the hotel. 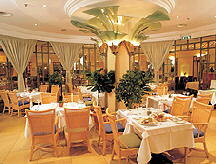 The hotel pampers its guests with a large variety of restaurants and bars within the hotel – the Bistro Jardin and Ristorante Giardino, the Lobby Lounge which features daily classical music at Teatime, the intimate Corvinus Bar with live piano music in the evenings, and the new Kempi Brauhaus, a lively authentic Bavarian restaurant, which when I had stayed at the hotel, was an English pub. I especially remembered enjoying wandering around the Kempinski Gallery on the 2nd floor of the hotel. The hotel Gallery features Hungarian artists, and rotates every two months. The night my mother and I went, they had a wonderful exhibit by Bí­ró Gábor, a Hungarian artist born in Budapest in 1947. His contemporary art was both refreshing and amusing – and we loved it! After we had enjoyed our stroll through the Gallery, it was time to have dinner. The Kempinski Hotel Corvinus Budapest has 2 restaurants: Bistro Jardin featuring informal dining with an international and Hungarian menu, and Ristorante Giardino, their Italian restaurant. Both have extensive menus, and both looked wonderful, but we decided to eat at the elegant Ristorante Giardino, and then selected from both of the menus! Although we were there in the evening, we wished we could have returned in the morning as well, because they have won “Best Breakfast” 3 years in a row, with over 150 items on their buffet. On Friday nights, the hotel has a Fish Buffet, and has live music, so that anytime one visits the Kempinski Hotel Corvinus Budapest is the right time of the day and week. We began our dinner with a selection of appetizers of minestrone soup, and grilled spinach-polenta roulade with Gorgonzola and tomato pesto. The soup was rich and flavorful, and the perfectly grilled spinach-polenta roulade that was wonderful on its own, was really enhanced by the Gorgonzola and tomato pesto. For our entrees, we selected veal medallions with asparagus and lemon, accompanied by a potato cake, and tomato risotto with giant prawn tails in a garlic-parsley butter. The veal medallions were very tender, and were accompanied by asparagus and a well-executed crisp potato cake. The creamy risotto was the perfect texture and was topped by deliciously seasoned prawns. We were quite satisfied after our fabulous meal, and although Victoria was able to resist the dessert temptation, I could not. When I saw the chocolate-wasabi mille feuille with white chocolate mousse noodle dessert, I had to try it! Chocolate and wasabi together, when would I ever get the chance to experience such a creation again? When it arrived, it really was a creation – almost too beautiful to eat, but I managed to eat it anyway! The dessert consisted of small thin layers of chocolate, topped with wasabi cream, more thin chocolate, more wasabi cream, and topped with chocolate. There was a thin chocolate mousse “noodle” accompanying the mille feuille. When I took my first mouthful of the wasabi cream combined with the chocolate, my mouth thought it was in heaven, a definite wow and a rush of endorphins! I love wasabi, but I have never even thought of using it in a dessert, much less with chocolate, but together it was a delightful dream. I really loved the combination of sweet and hot together. This sweet reminder of my visit to Kempinski Hotel Corvinus Budapest will remain in my memory until I have the opportunity to return again. Köszönöm, (thank you) Executive Chef Alf Wagenzink, for creating a truly unique and utterly delicious menu. Please read our Chefs' Recipes section where Executive Chef Alf Wagenzink shares 3 of his fabulous recipes. © March 2004. Luxury Experience. www.luxuryexperience.com All rights reserved.